Label packaging seems deceptively simple when you think about the end goal. It's just a sticker, right? But considering all aspects of the label's form and function within the broader context of your brand strategy is the best way to begin a label order. These 15 questions will help prepare you to receive labels with longevity that make your products shine. By answering these questions, you will be able to provide your customer service representative with the precise information needed to engineer the exact label that's best for your products and your brand, within budget and on time. 1. What's your label budget? With an amazing variety of choices, from colors, to label materials, adhesives, protection options, and embellishments, there are a lot of ways to build the best label. Knowing what you want and what you have budgeted for will help your label printer find creative solutions that look great, work well, and don't break the bank. 2. What quantity of labels do you need to print? With label printing, like all forms of commercial printing, prices scale down as quantities increase– often drastically. The fewer labels you order, the higher the cost of each individual label. Quantity considerations that account for future need can help you see big savings on reorders. 3. When are labels needed in hand? Your deadline for receiving labels is vitally important to the printing process, since there are several stages to ordering, art proofs and approvals, and producing your labels. We encourage our customers to begin the process early to avoid delays between the production of your product and getting it to retail. 4. What are the size dimensions of your label? Is there a particular shape you would like? Label size and shape effect pricing, particularly if you require a custom shape the has to be produced with a new custom die. 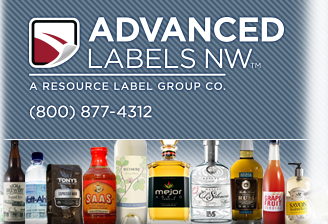 Advanced Labels NW has more than 5,300 cutting dies, as well as the ability to accommodate your custom needs. 5. How many colors do you want on your label? Full color labels are produced with offset CMYK, called 4-color printing. You have the option to add additional "spot colors" to extend your colors up to 10 with conventional flexographic printing, and 16 with digital offset printing. 6. How many different design versions of your label will you require? As long as your label variations are identical sizes, you can order as many version of your label design as needed, all within a single label order. As mentioned above, this will group your order and boost your quantities, which could mean big savings in the long run. 7. Will you be ordering the same label in the future, if so, how often and in what quantities? This may affect your choice of printing method. Your customer service representative will guide the decision between conventional flexographic or digital offset printing, and it's typically best to produce current and future label orders on the same type of printing press to ensure the highest quality and consistency of color reproduction. 8. Do you need any variations from label to label within the same label design (for example, game codes, consecutive numbering or alternate text). As with design versions, these variations can be included within the same order, with the same benefit. Variable data and variable imaging for labels is a great way to add interest to your shelf presence. This is a crucial question for the engineering of your label, and one that must not be overlooked. There are a variety of label materials, adhesives, and protection options designed specifically for hot or cold environments, and damp or humid environments. 10. Think of the life span of your product and label. How will your products (and labels) be shipped, stored, displayed in retail settings and used by customers? Similar to environmental exposure, let your label printer know if your labels need to stand up to outdoor use or industrial use. Be sure to consider the real world situations your labels need to perform in, including how they are stored and transported. These scenarios will help guide the selection of label material, adhesive, and protection choices such as varnish or lamination. 11. Are there any visual areas of your label you would like to call particular attention to, or highlight with custom decoration? Our experienced customer service representatives will help you decide on the best embellishments for your needs and budget. 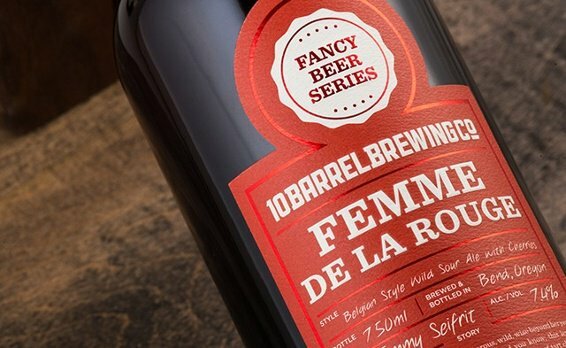 There are many ways a label design can be accented and brought to life through special treatments– embossing, foil stamping, spot varnishing, and eye catching combinations of all of these. 12. What type of container will your labels be applied to (for example, glass bottles, plastic tubes, bags, or cardboard boxes)? Your container type will effect your label material and adhesive options. If there is a look and feel you would like, let your label printer know. With the knowledge of your container type and the environment and handling your self-adhesive labels need to perform within, your options will naturally narrow down. Some material and adhesive combinations are designed for use on squeezable tubes, some for freezers, others for rough container surfaces. Knowing what you want as well as what you need will help your label printer find the best material (such as paper, film, or metallized stock) for your specific container and application. Experienced custom label printers can often spot potential red flags and provide some guidance on regulatory compliance. Ultimate responsibility falls on the brand owner however, so be sure to keep up to date on the requirements for your specific market. There are many resources available to get you started, and the detailed information you will need is online at the websites of each regulatory body. The last thing you want is a fine, or worse a product recalled from store shelves due to a violation. 14. Do you want to include lengthy, branded content or content for multilingual audiences on your label? If you have a lot of information that needs to be included on your labels and not enough space, you have a few options for increasing your label real estate. Extended content or booklet labels, hang tags, and clean release labels are creative solutions you can consider in these circumstances. 15. Will you be hand applying or machine applying your labels? If machine applying them, which roll direction do you require? Label application machines have varying requirements for core size, roll size, and rewind direction. If you are hand applying your labels, rewind direction will not matter, unless you have a preference based on your workflow. When hand applying labels you may want several smaller rolls which are easier to move around or distribute between a team of people helping with the labeling.